The first controlled study examining marijuana as a treatment for post-traumatic stress disorder needs just a handful more U.S. military veterans to volunteer as test subjects before it can be completed, the study’s nonprofit sponsor announced Thursday. More than 2.7 million men and women have been deployed to combat zones in Iraq and Afghanistan since 2001. 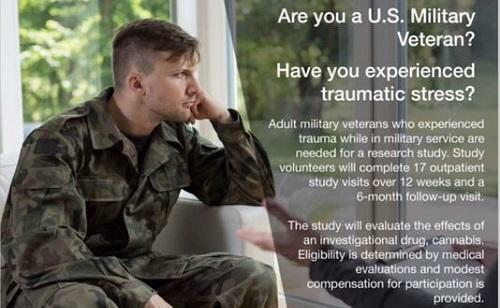 As many as 20 percent of veterans may return with Post-Traumatic Stress Disorder (PTSD), according to Department of Veterans Affairs (VA) data. Many combat vets anecdotally report using cannabis to successfully treat symptoms of PTSD, but without data from a controlled study, mainstream medicine—and the VA health system—have been slow to accept marijuana as a treatment, despite pressure from Trump Administration officials who suggest cannabis may be effective.